New Zealand’s back country is filled with huts used by trampers (hikers), mountaineers and climbers throughout the year. 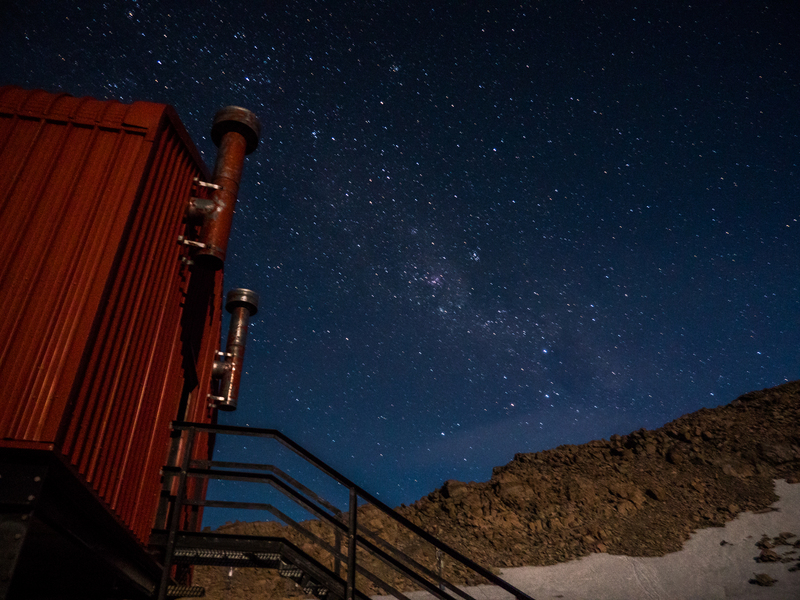 Ran by the Department of Conservation (DOC), each hut varies in its provision, with some little more than some bunks and a platform to cook on, with others offering larger kitchens with gas and water. Mueller Hut is one of the most accessible huts in New Zealand’s back country, being just 3-4 hours walk from the car park at the bottom of the mountain. In summer months it is also staffed by a volunteer warden. This makes it an ideal “first time” Hut for many adventurers! We were going to do this as a long day hike, but we managed to grab some last minute cancelled spots, so after a mad dash over from Tekapo we started up at around four in the afternoon. If you can get a spot overnight then do – the sunset and stars are worth it. If you can’t and the weather is good go for a day hike anyway, the views are stunning. When the weather is really poor, it probably isn’t worth it as you won’t see anything! The Mueller walk starts by following the Key Point and Sealy Tarns route up the mountain. The tracks set off from the White Horse Hill Campsite, or if you wish, you can start at the visitor centre in town, but this adds a significant chunk of time onto your journey! 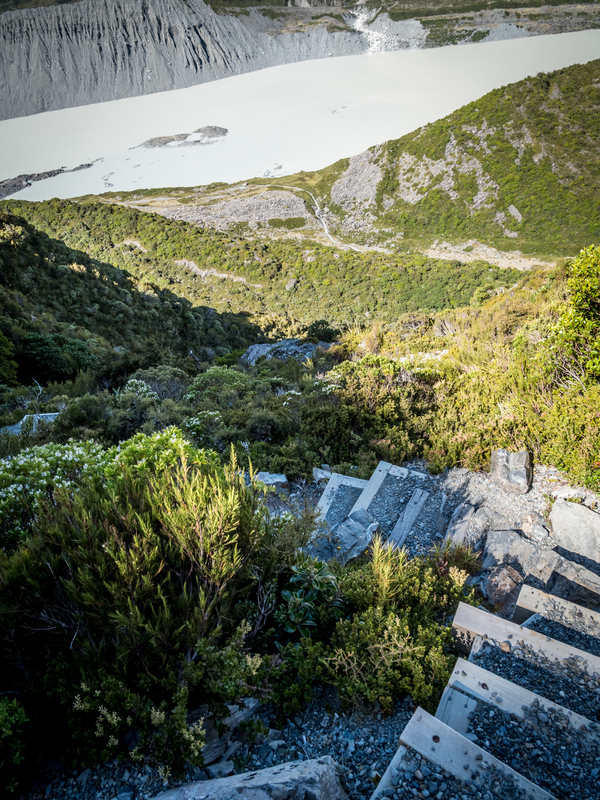 From the car park a gravel path meanders pleasantly along to a split, with Kea Point heading off to the right and Sealy Tarns/Mueller Hut route to the left. The walk to Kea Point is a short twenty minute return diversion or forty minute return trip in its own right. 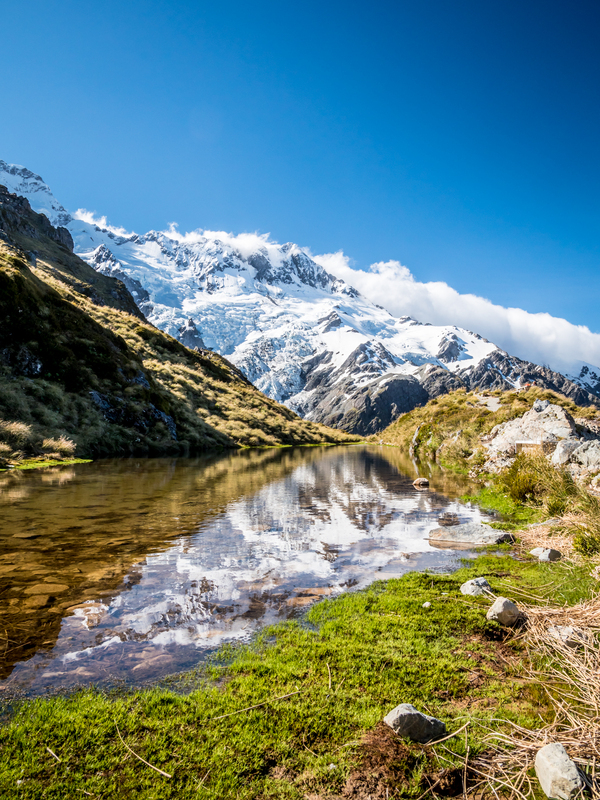 It offers a good lookout over Mueller glacier and lake with the Mount Cook range looming behind it. We did this on our return journey, when sadly the weather was closing in and Mt. Cook was shrouded in cloud. The thus far pleasant walk, begins to climb steeply upwards after splitting from the Kea Point track. 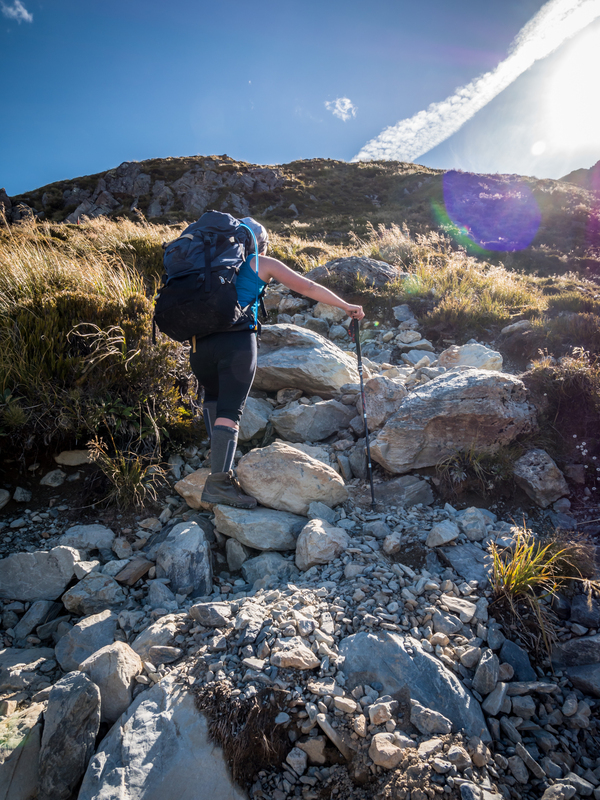 The path gives way to a flight of stairs, and another and another…the remainder of the climb to Sealy Tarn is an arduous calf wrenching plod up nearly 2000 stairs, which begin by winding through shrubs before opening out onto the rocky face of the mountain. In this photo, you can see the path to Kea Point in the distance, heading left towards Mueller Lake. 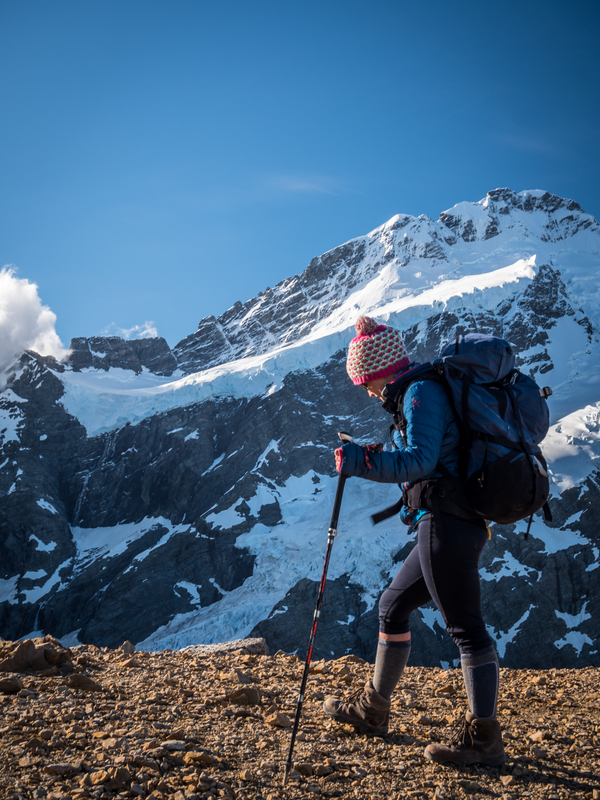 The pain endured by this challenge is well rewarded as you rather abruptly reach a plateau, where several Tarns reflect Aoraki’s beauty. We took ten minutes to rest here whilst contemplating the remainder of our hike. We were only half way, and the rest of mountain loomed rugged before us. The beautiful Sealy Tarns – definitely worth the walk! From Sealy Tarns you head up onto the rocky face of the mountain and bunny hop between the orange/black poles that act as waymarkers. In bad weather, I can imagine that seeing from one pole to the next could be a challenge making route finding difficult – on the way up we managed to lose the “path” several times, choosing more difficult routes in our attempt to beeline between poles (as the actual paths do zigzag slightly). As we neared the top of the face, we headed out onto a vast scree slope littered with rocks from boulders the size of small cars right down to tiny pebbles. From here, even in summer, the snow line begins and we found at the end of the day, the sun’s warmth made the snow sludgy and hard going to walk through! Upon reaching the top of the slope, you turn immediately left, and the gradient eases, following the ridge line and leading you all the way, through more patches of snow, to the hut. Beautiful backdrop on the final leg. Following a ridge line to the hut. In summer, the hut stands proud of the land, raised high in the air. In winter the height of the snow pack means you can walk right to the door! The heavy metal doors have huge storm latches to secure the doors closed in high winds. There are two bunk rooms, and a large kitchen/dining area. 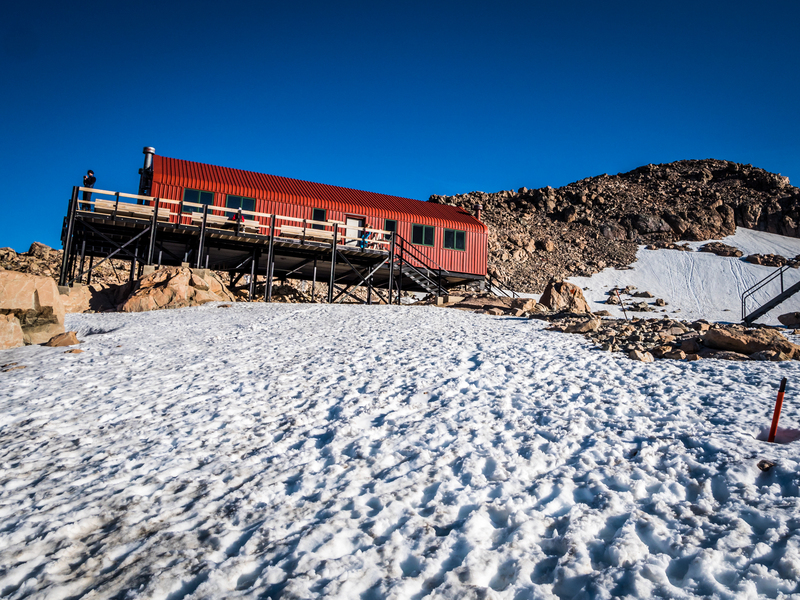 Even in Summer, snow adorns the ground around Mueller Hut. That evening we watched as the sun dipped down behind the mountains throwing a golden glow onto Aorkai/Mt. Cook. As the sky grew dark, the stars appeared, dotting the night sky with thousands of pin points of light. However, with the temperatures plummeting to below zero with winds predicted up to 80km/h we didn’t stay out for too long, heading for bed, snug in our sleeping bags whilst the wind howled away outside. We awoke early the next morning to the wind and muffled sounds of others getting ready. We made a hasty start, hoping to get down before the predicted rain came in. Walking back along with ridge line buffeted by the wind gusting made for an interesting experience. The wind speed diminished as soon as we started descending the scree slope and from here it was a relatively easy plod back the way we’d come – although the following morning, and indeed for several days, we both struggled to walk without looking like penguins, a testament perhaps that we aren’t as fit as we once were!